From 1987 to 1990 was, arguably, the most dynamic chapter in the history of Saint Mary’s football and, by extension, the Atlantic Universities Football Conference. It was the Chris Flynn era at Saint Mary’s and the pivotal figure at the centre of excitement was a 6’2″, 190 lbs. package of talent and imagination out of Buckingham, Que. who was destined to become the most dominant football player in the CIAU for four years. 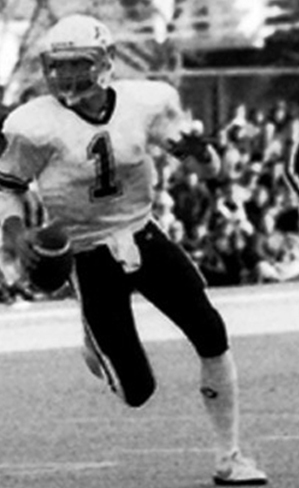 Flynn led Saint Mary’s to a 27-2 regular season record; four AUAA championships; and two Vanier Cup appearances. In 1988, Chris had to sit out the national final with a fractured skull and in 1990 he had to have his separated right shoulder frozen to enable him to play. In 1988, 1989, and 1990, Flynn and the Huskies lost only three games. His individual distinctions were awesome; four-time AUAA All-Star QB; three time CIAU All-Canadian QB; CIAU records for most TD passes in a season and career; leading rusher QB in CIAU history; and the ultimate mark of greatness, his unprecedented three times as national MVP Hec Crighton Trophy winner. Chris Flynn was the guy who could do it all mechanically, yet through an intuitive art of improvisation had an uncanny ability to call the right play in any given situation. As a freshman he performed mostly under directions from the bench. But it didn’t take head Coach Larry Uteck long to realize this was a young man of rare gifts and an analytical mind. The sight of Chris Flynn scrambling in the backfield, warding off defenders and controlling the play until he uncovered his receiver was a sight that fans will forever cherish in the career of an exceptional athlete.